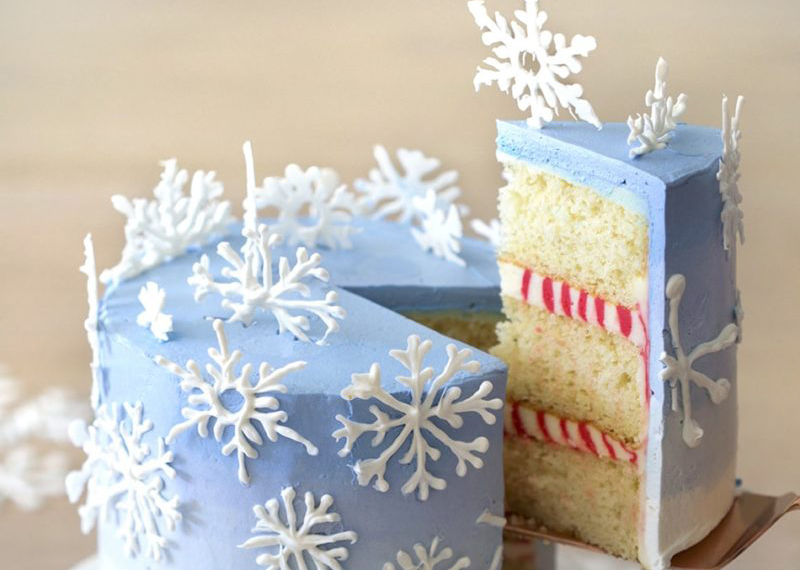 Candy melt snowflakes make this peppermint-kissed cake a showstopper. A special time of year calls for a special cake! 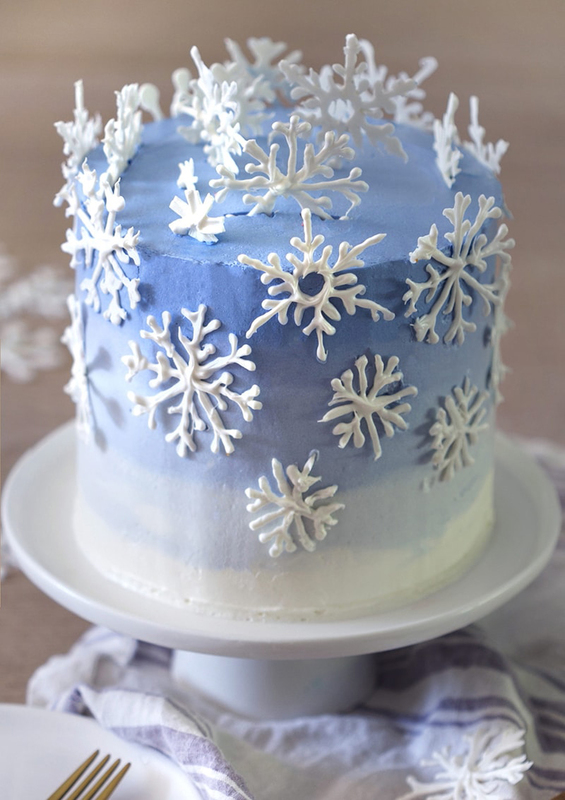 This ombré peppermint snowflake cake is a winter wonderland showstopper! Candy melt snowflakes cover this peppermint-kissed cake with a candy cane surprise in every piece. Butter and paper three 6-inch cake pans. I use cake strips on my pans for more even baking. Sift and mix dry ingredients in a large bowl. Bake for about 30 minutes until the centers are springy to the touch. Transfer a white batch to a piping bag. Add red food coloring to another batch and transfer to a piping bag. Snip off the tips of both and add to a larger piping bag. Pipe a spiral between each layer. Pipe and smooth a crumb coat with excess. Beat the egg whites, salt and cream of tartar, slowly add in 1/3 cup of sugar and continue beating until soft peaks form. In a medium saucepan add the remaining sugar and 1/3 cup water then place on medium-low heat. Stir until sugar melts and becomes clear.Maintain at medium-high heat until temperature reads 235-240F. Drizzle the sugar into the mixer immediately. Run mixer until meringue is cool/tepid. Add room temperature butter into running mixer one tablespoon piece at a time. Add the salt and vanilla if using. Beat until butter is combined and mixture has reached a silky consistency. 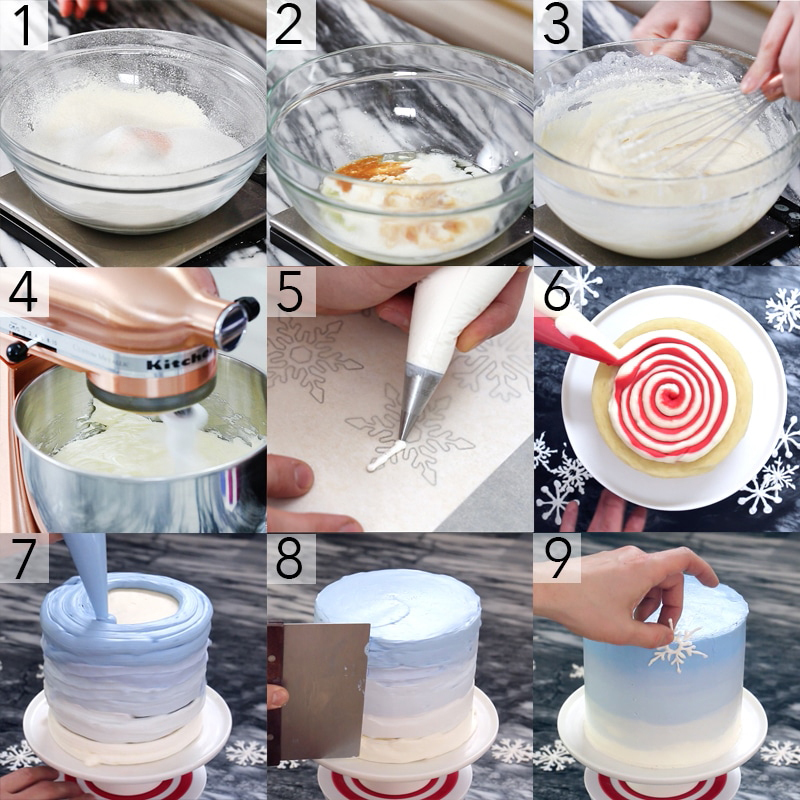 Create a gradient by adding different amounts of blue food coloring to remaining buttercream batches. Transfer each color to its own piping bag. Pipe the ombre color and smooth with an offset spatula. Transfer to the piping bag and snip off the tip. Pipe snowflakes onto a piece of parchment paper. This can be done freehand or over a snowflake stencil. Pipe the red and white buttercream between each cake layer. Pipe white, then blue buttercream, lightest to darkest starting from the bottom.